Located in an elevated position on the southern end of the Waitakere ranges, this quiet location provides easy access to the many walking tracks in the area. Walk to the Arataki Visitor Centre along a picturesque bush trail, or walk in to Titirangi along the historic pipe line track. Titirangi village includes cafes, shops and and an art gallery. Good bus and train links throughout Auckland. West coast beaches are a short 30 mins drive away. Stays of 7+ nights automatically receive a 10% discount. Stays of 28+ nights automatically receive a 15% discount. Your hosts are Jason and Salome. We have two children, Luca is 14 and Amelie is 12 years old. Jason and Salome have been married for 16 years. Jason was born in New Zealand and Salome was born in The Netherlands and immigrated with her family when she was 6 years old. Salome can still speak Dutch and some limited French. Before having children Jason and Salome traveled around Europe and have been back once with their children. As a family we enjoy the bush walks around us and also traveling around New Zealand or overseas when we can. If you want to be close enough to the center of Auckland city but still enjoy the tranquility of a bush setting then this is definitely the place for you. Bush views and native birds. A north facing house that gets all day sun. A quiet location. 30 minutes drive to the center of Auckland city. Bush walks on your doorstep. Good cafes 5 minutes drive away. Bathroom includes a Shower, Vanity with mirror, Heated Towel rail, extraction fan. Bathroom also includes a front loading washing machine. The Toilet is in a separate room. Right next to the accommodation. Easily accessible. Plenty of towels are provided to guests. Basic everyday items included such as coffee, tea, salt, pepper etc. Cups, glasses, plates, bowls, basic serving dishes and utensils supplied. Small range of cooking implements also included. Small selection of toys and games for children. Outdoor area with table, chairs & shade sail. This is a lovely home with spectacular views. My daughter loved the trampoline, swings, and chickens. The home was immaculately clean and well decorated, and the kitchen was well stocked. We loved the peace and quiet, and my favourite was the beautiful bush walks right out the front door. Good communication, great location. Well marked and maintained bush tracks nearby. Clean, comfortable and well presented home. There was a damp smell, so windows needed to stay open for air to circulate. Appreciated the sofa bed being set up for us, very comfortable. Thanks! Spacious and tucked away in the bush. The property is in a lovely quiet location with a great outdoor area and a fuseball table much appreciated by the teenage/male members of our family! The kitchen was stocked and there was a thoughtful offering of chocolates in the fridge to greet us. I would recommend some new pillows as the present ones are pretty flat. We only had 2 nights here but longer would have been very pleasant. Thanks for the feedback, we will look into getting new pillows. Great accommodation for a family - lots of room outside to run around and play equipment available. Great accommodation for a family - lots of room outside to run around and play equipment available. Situated in gorgeous part of Titirangi with lovely views. A quaint New Zealand bach in the beautiful native bush. If you are looking for a quiet, tranquil retreat this would be a great option. Walking tracks on your doorstep including the Beveridge track linking directly to the Arataki Visitors Centre. Several Beaches a short driving distance away. 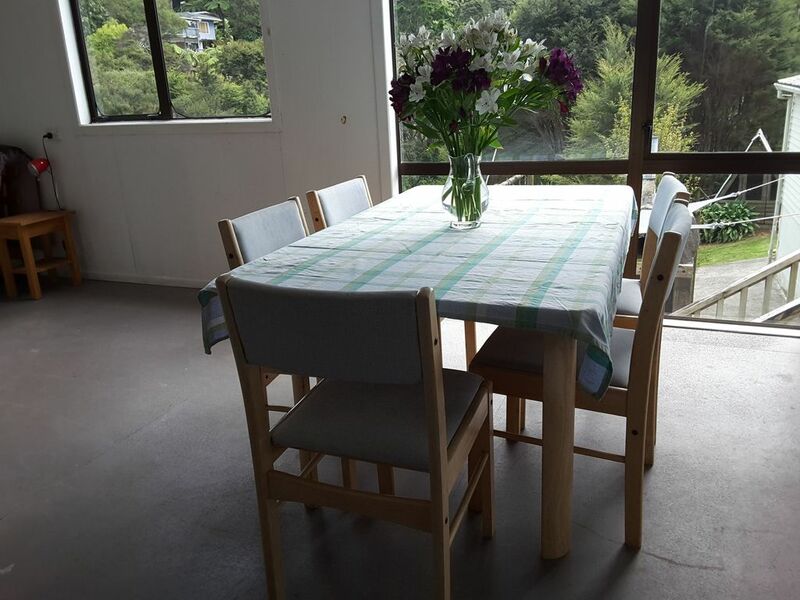 Titirangi village half hour walking distance on a picturesque track, includes cafes, shops and and an art gallery. Good bus and train links throughout Auckland. Approximately 30 minutes drive to the center of Auckland City. Enjoy the benefits of tranquil living while still being close enough to the city center and all it has to offer.